Samsung’s Galaxy S9 Plus was the best-selling smartphone this April, according to the latest edition of Counterpoint Research’s Market Pulse report. The Android flagship accounted for 2.6-percent of global sales over the 30-day period, with its smaller counterpart — the Galaxy S9 — achieving the same overall percentage but placing second. The next three spots were taken by Apple’s 2017 iOS devices, with the iPhone X now being dethroned by Samsung’s latest high-end offerings and Counterpoint Research attributing that development to seasonality. Xiaomi Redmi 5A, Redmi 5 Plus (Note Plus), and Samsung’s Galaxy S8 also made the top ten list, together with Apple’s iPhone 6 and iPhone 7. 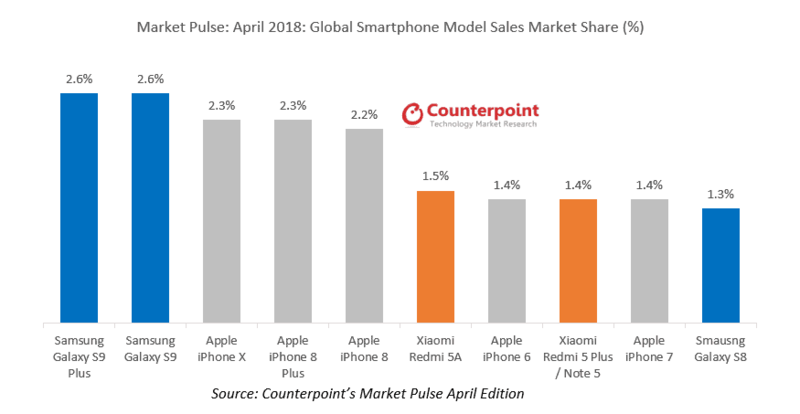 While Samsung remains the largest smartphone company in the world by both shipments and sales, Apple is still dominating in the flagship segment, as evidenced by numerous reports, including the latest study from Counterpoint Research, with half of its top spots being taken by iPhone models. Samsung’s ultra-premium smartphones traditionally lose steam in their second year of commercial availability but the Galaxy S8 series is now defying that historic trend as Samsung opted to enroll the lineup in a number of aggressive promotions, particularly in India where it’s presently fighting off Xiaomi that’s aiming for its number one spot in the world’s fastest-growing smartphone market. Some industry trackers — Counterpoint Research included — believe Xiaomi already overtook Samsung in the South Asian country, though Gartner and a number of others disagree. Another significant trend observable on the chart seen below is that the list of the world’s top ten best-selling smartphones in April doesn’t feature a single mid-range device, with all of them being either flagships or entry-level offerings. The phenomenon can be explained by the ultra-competitive state of that price bracket, particularly in developing countries where smartphone adoption rates are now outpacing those in developed markets which are already experiencing signs of device upgrade fatigue and overall saturation. The post Samsung Galaxy S9 Plus Outsold All Other Phones In April 2018 appeared first on AndroidHeadlines.com |.